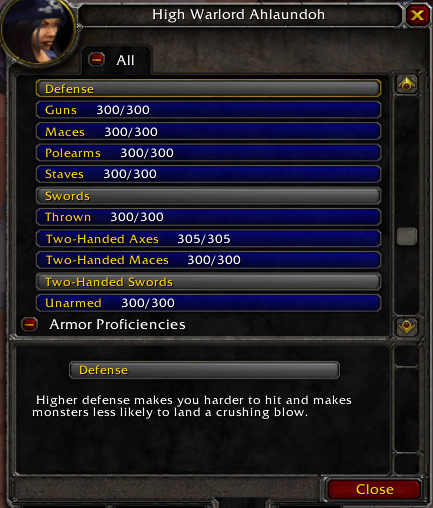 the command to change your weapon/defense skill needs to be either disabled or changed. as some ppl messed up my own skills and their own - intentional or by accident (targetting others while typing the command) - its allready a huge mess right now. can't expect everyone to fix his skills before the first raids, so id say a complete wipe of skills + set everything to maxskill + disabling .setskill would be good. I do not know whether this is due to PTR, but last 2 days when try to login Cronos getting message about ban. For testing typing random login/pass and receive again this ban window. When checking Account manager ( by topic https://forum.twinstar.cz/showthread.php/95372-ARE-YOU-BANNED-NEED-HELP-CLICK-HERE!!!!!!!! ) - no bans, all is clear. Played mainly PTR (sometimes re-loged to K1 for ore farming (max 20 mins), no cheats,etc - just testing. And some of my frineds today got ban window too. UPD. Sometimes ban fades, but when relog in WoW PTR - getting it agian. The Attunement Requirement to enter Naxxramas has been lifted. This have been done to mask the difficulty of the instance, so that the challenge can be saved for the release version. We need as much feedback as possible on the mechanics, spells, groups and patrols inside the instance. I want to thank the Kronos team for pleasant Spider wing experience! Most of the stuff was working as intended and we had loads of fun testing mechanics out. A full report with bugs we encountered will be published in the near future. Keep up the good work, was very good so far. The first couple of clears have shown us that the issues are so limited that there won't be a need to have the wing open for the duration that was previously announced. Instead Spider Wing will be closed on the PTR on february 14th. This leaves guilds with 2 clears of the instance. The plan is to have the discovered issues fixed by friday (february 10th), so we advise that you schedule your 2nd clear during or after the weekend. Creating multiple characters to overcome the instance lock-out will not be accepted, and anyone who tries this will receive a 5 day ban starting on the day of the actual naxxramas release. In addition, we will also introduce a feature that automatically kills the boss if he leaves combat 4 times to prevent resetting the encounter over and over to gain more practice on the encounter. The PTR is available so we can find bugs, not to be a practice-simulation. I will provide a full and detailed report and use the bug tracker for everything we found. So far the most egregious bug is the fact that you can completely destroy Anub'Rekhan's script by moving when he's casting locust swarm, causing him to follow the main tank and stop casting it all together. A 5-day ban isn't much of a deterrent if those players in question aren't playing then. i was looking for the bugreports concerning naxxramas on the bugtracker but i couldnt find them. Yes, submitted as internal report. We've observed some issues ourselves, and we've received feedback from Vanguard so far. If any other guilds have any observations they want us to look into then you should provide it as soon as possible, as we'd like to have some time to research it before applying the updates in the weekend. Pretty sure the Ghouls are indeed supposed to be immune to shackle. I can't recall having seen them shackled back in the days, it would also make it too easy. It says they are stunnable and they have to be tanked apart -> kinda indicates you couldn't shackle them otherwise it might have been mentioned as an easier tactic. For the Infectious Ghouls (Ghouls in the Plague Wing, before Noth) it is mentioned that THOSE are SHACKABLE, but those Infectious Ghouls are different from the Plagued Ghouls that are placed in the Outter Ring of Naxxramas. That should hopefully prove enough that the Plagued Ghouls should be immune to shackle. cause otherwise it should have been mentioned on the wiki. But again, it's indeed more indication than solid evidence. Couldn't find anything about the Deathhounds, but those have bare been killed at all back in the day, cause you usually never crossed their paths on the way to the wing end bosses. - Spider Web from Carrion Spinners will now pull the player to the spider. - Spider Web from Carrion Spinners will now also be used to reach their primary target if they are not in range to attack him. - Poison Charge from Venom Stalkers and Necro Stalkers will now also be used to reach their primary target if they are not in range to attack him. - Naxxramas Cultist and Acolytes are now immune to Charm effects. - Ghosts of Naxxramas will hit significantly harder. - Corpse Scarabs not in combat will despawn after a while. - The Anub'Rekhan door can no longer be opened while the encounter is in progress. - Lowered wall-cocoons on the left side of the wall to prevent line of sight issues. We've received a lot of feedback, and we're processing the reports one by one to find evidence for your suspicions being correct or not. We have also confirmed some issues that haven't been applied to the PTR as we haven't found a sollution to the problem yet. There will be no more updates done to the Spider PTR, but any more feedback provided to us will be taken into consideration before the final release of naxxramas. So it's true! Nax is coming! I am hoping we will have a raid that will not be cleared by any guilds in the first days (and later weeks). Please keep it brutal. Please keep it unfair. C'Thun is already a great fight and the first one that seems to keep the challenge up. I understand Naxx was practically unbeatable before TBC, but that is pretty much what a lot of us want. That being said, I have not done any Naxx testing on the PTR yet. My apologies if I am misunderstanding the changes. It will be slightly harder than Blizzlike on purpose. Any updates on when the next wing will be up on PTR for test? All the raids are blizzlike, why should naxx be an exception?